Discussion in 'Colored Gemstones' started by kittencakes, Jan 9, 2019. I wanted to ask the experts before purchasing. I am looking at purchasing a 2.13ct ruby. This lovely seller has told me the gem is hard to capture in photos but it’s very glowly in person. I am looking for a bright, glowly red. What do you think? The only treatment is heat. Hi, no 1, you need a lab report. There are just sooooo many rubies out there that as well as “heat” include flux filling and Beryllium diffusion treatment. You cannot “trust” a seller, only a lab report tells the truth. There is nothing necessarily wrong with buying a flux filled ruby or one that is BE treated BUT the price should be very cheap ! No 2 - return policy of seller. Gems look different in real life, someone’s else opinion of “red” or “glowy” may not match yours. You want to be able to return the gem, no hassle, for a full refund (excluding shipping) if it’s not as you expected. The sellers photos arent great. You should ask for photos against a white background in natural outdoor light ie daylight and inside at night with ordinary lighting. You can’t assess the cut from the photos, it may be windowed. And I think it might actually be less transparent than you expect ie translucent and more pink than “red”. JPie and kipari like this. And just to add, a “heat only” ruby of 2 carats should be costing between $5,000 and $15,000 depending on tone and clarity. A 2 carat true red ruby with good clarity, just heat, is easily around $15,000. On the other hand a 2 carat glass filled ruby is about $50. This is why you must have a reputable lab report. A “bargain price” 2 carat ruby won’t be because the seller is naive or foolish and is mistakenly selling you a $5,000 plus ruby for cheap. It will be a treated ruby. Reputable labs include AGL, GRS Swiss lab, Lotus Gemology or GIA . Anything from India, China, Thailand etc is highly dubious and not to be trusted. Agree with all that @Bron said, but the part quoted. Lotus Gemology is in Thailand, nowhere else. AIGS is also a reputable lab in Thailand. I would personally say trust but verify. Make sure you can get a refund if stated claim cannot be verified. Burmesedaze, ChaiK and chrono like this. GIA, GRS, IGI, etc etc are all in Thailand not to mention many others. Sorry Bron, but I find such a claim dangerously close to 'not publishable'. How many small but honest lab owners are doing their best everywhere? And wasn't it GIA in the US where people went to jail for faking diamond reports for the middle east? I think you should retract that comment? Nan Yang lab is very reliable. Check refund policy. You want full refund (minus postage you may have to accept). Check for cracks, chips window and extinction - get vendor to confirm there are none of these. Inclusions and silk are normal. I sometimes don't mind windows but difficult to explain so I will leave that. Reds are difficult to capture in photos. Nan Yang is reliable but for a 2 ct ruby, I'd still stick with a bigger named lab such as GIA, GRS, or Lotus. Ruby is a tricky one to assess correctly. TheGarnetGirl and lovedogs like this. I do not like it when all of the shots a seller provides are on the hand. If I am buying on the internet I would like to see the stone from all sides and angles. A hand shot can provide some idea as to how the stone appears sizewise (yes I know that hand size differs but that is why we ask posters to post a hand shot of a new ring! Does anyone know on what value above is there a customs duty and how much is it? My intention was to reference the “lab reports” that seem accompany gems that abound on eBay / Etsy that turn out most definitely to be “not as described”. I myself, in the past with less knowledge and experience, have been mislead into buying “glass filled” and BE treated gems on the basis of one of those “lab reports”. So my point is, unless a gem comes with a report from a well known and reputable lab who is known to have the correct equipment to detect the latest enhancements and treatments, you might be buying something “not as described”. TheGarnetGirl, kipari, suzanne2 and 1 other person like this. 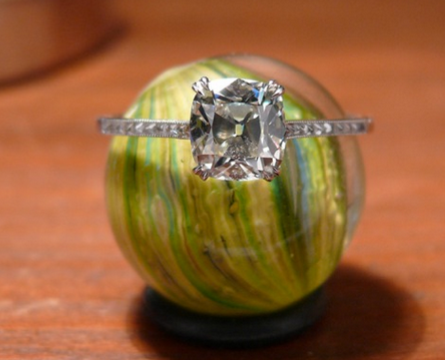 Is the stone unheated/untreated? Nanyang gem labs is supposed to be really good, but no one has been able to confirm that they have LIBS testing for me yet -- which would make it safer to go with rubies and sapphires which are unheated. Edit -- I just realized your not in singapore, I would search stuff closer to you. Just leave out the condescending country references and we will be OK. There might be shady labs in Switzerland, too. And size and reputation does not guarantee honest employees either. Of course a 100.000 gem deserves all labs in the world but for simple stones (no heat at all) or lower values, one can give a chance to smaller labs. If a sapphire s 100% not heated, they won't need an LIBS or whatever, right? I considered starting a lab in Germany (we have only DSEF) -- dream-dream -- and if everybody only trusts the big labs, then no newbies have a chance ever. Burmesedaze, voce and ChaiK like this. To answer OP's question, in the US we are customs free $2500 and under. VividRed and lovedogs like this. Burmesedaze, suzanne2 and chrono like this. Is this being sold by Enohring (spelling?) either via etsy or LT? I think who the vendor is makes a difference, because I believe other PSers have had excellent interactions with her, and she has been shown to be trustworthy. Just IMHO. That doesn't mean you shouldn't be careful, but it is important to keep in mind. Large labs are best for corundum, emeralds, and alexandrite. There’s nothing wrong with the smaller labs for other gems. I’ve had issues with even AIGS for a sapphire. In my case, I had to eventually send it to AGL to get it properly verified. Sometimes the accuracy of a mass spectrometer is needed. Some of the larger labs can detect irradiation whereas smaller labs cannot. chrono and TheGarnetGirl like this. May not be viable for less pricey gemstones but for big ticket items, worth considering. However, given your importation situation you are importing [non-commercial goods] (as in not-for-resale). If the importation is for commercial goods (for resale), if under US $2500, you can self-import. If above US $2500 you must contract with a customs-house broker to process the package, for a fee. Either way, importing into the US there will not be a duty regarding loose gemstones or gem rough. MrsKMB, lovedogs, voce and 2 others like this. I don’t know if this will help, but I inputted this into my FedEx account. MrsKMB, SparkliesLuver, mellowyellowgirl and 5 others like this. Pinkish but definitely and STRONG color. If you like it, it's great.